Keen on Camp: Kids explain why they can't wait to go back | Camps | Kids VT - small people, big ideas! 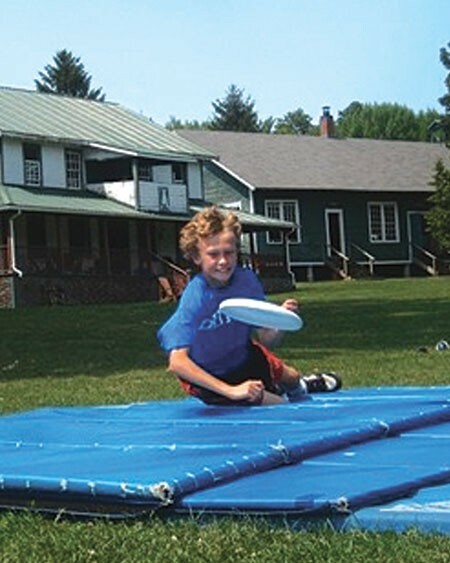 Kids VT has published several stories about camp this year. Our writers have interviewed administrators, counselors, American Camp Association staffers and parents about the pros and cons of various types of summer sessions. This month, we decided to ask kids to tell us about camp in their own words. Four local campers — two girls and two boys — shared their stories with us. It wasn't difficult to get them to talk. Once they started, they didn't want to stop! Here are some highlights of our conversations. Warning: Reading this story could make you wish you were going to camp this summer. Camp Kiniya is a girls' camp on the shores of Lake Champlain; Camp Dudley, the boys' facility, is located across the lake in Westport, N.Y. They claim to be the oldest continually operating summer camps in the country. Olive launched her Camp Kiniya experience with a weeklong session when she was 7. Last summer, she went for a month. She's headed back for four more weeks in June. Favorite thing about Camp Kiniya: "Food is one of my favorite parts about camp. The cook, Gail, is amazing. All the food there is really good. We have pizza, scones, oatmeal, fish sticks, chicken, noodles, salad, just all these different kinds of foods. On Sunday, she makes doughnuts. I get to try a lot of foods I don't get to eat at home." What's the social scene like? "You get to meet a lot of new people from a lot of new places. You get to spend time with girls you might not spend time with otherwise — you can have a lot in common. You just make a lot of friends." Did she learn anything new at camp? "Something new that I learned was archery and lacrosse. I thought they were really fun. I want to play them when I get older." Favorite camp memory: "When I first got to camp and I saw how beautiful camp was, and all the new people and counselors. And also the first time I ever cantered on a horse." A scary camp memory: "The first time getting on my horse. My horse was gigantic, and I was really little." What does Camp Kiniya's motto, "The other fellow first," mean? "It means, like, say that, when you go swimming, it's full, and your friend really wants to go. You would let her go first. It's not thinking about yourself. It's thinking about the other people, too." Young musicians audition to attend Kinhaven's high-level, coed summer music programs, which draw participants from all over the country. While there, students play in orchestras, perform concerts and receive private lessons. 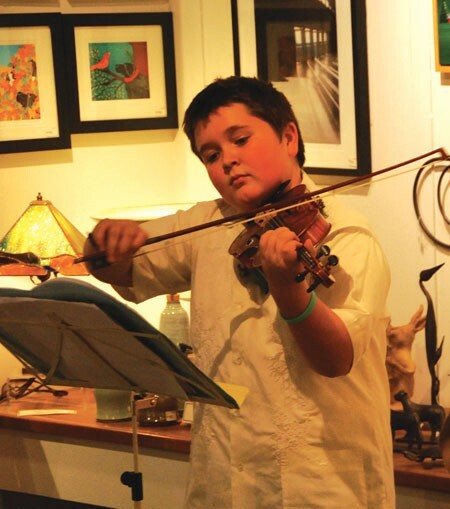 Violinist Gabriello Lewis will be returning this year for the second time to attend the two-week junior session. Next year, he'll have to audition to move up to the senior session. Smith loves Kinhaven so much that he's paying his own way — he earned $1100 toward his tuition last year by busking on the Church Street Marketplace. He'll be out again soon, passing the hat. What's so special about Kinhaven? "It's kind of like that one thing that you have — that one thing from your childhood that you don't want to give up. It's just too good to describe. You're away from everybody else for 10 days, except for the people who love doing exactly what you do. It's great." Favorite thing about camp: "Getting to make so many friends. They're all very passionate about what they do. I live in Burlington, and there's a large group of people who play instruments. But a lot of kids play instruments because they have to. It's kind of nice to be in a group of 70 other kids who all love the instrument and don't just play it because they have to." Favorite music to play: "Romanian folk dances by Bartók." How much does he practice the violin at camp? "I spent three hours practicing every day. That's just me, myself, practicing. I know there's one kid who studies with Itzhak Perlman. He practiced for six hours a day. We didn't believe him, but we took shifts just watching him to make sure he didn't stop." What else is there to do at camp besides play music? "The boys did rugby, football, soccer, seeing who could hold their head underwater in the freezing cold lake the longest, that sort of thing. The girls did nail-painting parties, I believe." Best camp memory: "Staying up until midnight playing Mafia." During the school year, Hannah is a member of the BFA Fairfax Elementary School cheerleading team. 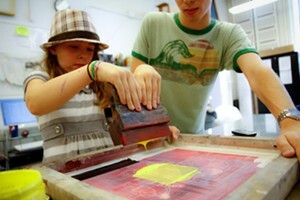 Over the summer, the school hosts a three-day day-camp for middle- and high-schoolers who want to step up their game. Hannah attended for the last two summers and is headed back this year — with her little sister in tow. "I can't wait," she says. Why cheer camp rocks: "The coaches are different from the regular school coaches. They just have a bunch of different moves. And in camp, you don't have to worry about any competitions. It's just for fun. You don't have to stress about it." Favorite thing to do at camp: "Tumbling — I'm working on my back walkover right now. Cheer camp is really where we get to tumble the most. My goal by the eighth grade is to get my roundoff back handspring down. I would like to be one of the top tumblers on my team." Does going to camp give her an advantage during the regular season? "I learned a lot of different moves. I went from just being able to do a cartwheel to now being able to do a walkover. It's definitely helped a lot." Camp Abnaki is a boys' camp on Lake Champlain run by the YMCA. Neuhaus is a veteran Abnaki camper; this will be his sixth summer session. He went for two weeks when he was 7 and has gone for a month every year since. He says he had so much fun the first year that he cried when his parents came to pick him up. What does he love about camp? "Oh man, everything. All the time at school, there's a teacher trying to boss me around, tell me what to do. At home, my parents boss me around, tell me what to do. At camp, they lay out the ground rules on the first day. It's like, 'Have fun — and flush.' That's it, pretty much. It's awesome. There's no obligations for four weeks. You don't have to do anything." Why he likes campin' with the boys: "We can do basketball pickup games with shirts and skins. It lets you get away from all of the drama of everything." Favorite organized camp activity: "Basketball — where I live, it's hard to get a pickup game going." How he spends his free time: "There's this card game that I really like called Magic: The Gathering. Everybody there likes it. If you collect all the good cards and you play them right, you win." Best thing about weekends: The counselors organize special programming. "It's always something really fun but kind of stupid. Last summer we played Zombie Apocalypse — half the kids were zombies and half were human survivors." Favorite camp memory: "If you go for five years, you get to be this thing called Medokenack. It's really cool, because you get this patch thing that you can keep, and there's a ceremony. It sounds kind of cheesy, but it was, like, an honor." Advice to kids considering going to Camp Abnaki: "Go. You'll love it. Don't be scared. Everyone there is awesome. Everybody loves you. Nobody is going to be a bully. Plus, it's going to be a lot of fun."